Mr. Riccobono holds degrees from the Eastman School of Music, Penn State University, and a Performers’ Certificate from the Cleveland Institute of Music. He has performed concertos with the Penn State and Florida State University Orchestras, Interlochen Arts Academy Band, Encore Society of Winds, and the Traverse Symphony Orchestra. 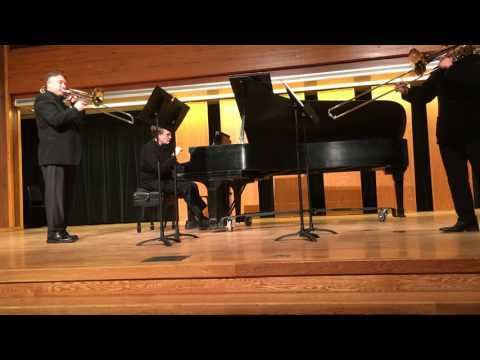 He was a concerto winner and soloist at Pennsylvania State University and Florida State University, and a solo competition winner at the Eastern Trombone Workshop. Mr. Riccobono has performed with the Savannah Symphony, Detroit Symphony Orchestra, Rochester Philharmonic, Milwaukee Symphony, Schleswig-Holstein Musik Festival Orchestra in Salzau, Germany, Spoleto Festival Orchestra, Italy. He also performed with such commercial acts as the Temptations, Four Tops, Moody Blues, Four Irish Tenors, Abe Laboriel, John Fedchock, Harry ConnickSr., Luciano Pavarotti, Doc Severinsen, Don Rickles, Yes, Ian Anderson, Bernadette Peters, and conductors Christoph Eschenbach, Mstislav Rostropovich, Lorin Maazel, Kevin Rhodes, Robert Shaw, Louis Lane, Michael Stern, Leon Fleisher. He has performed recitals and master classes at universities, colleges and summer festivals throughout the nation. He recently performed, taught master classes, and conducted at the Filarmónica Joven de Colombia and and in Beijing and Shanghai, China. He is the conductor of the Benzie Area Symphony Orchestra and is principal trombone of the Traverse Symphony Orchestra. He lives in Traverse City with his wife Jeanmarie and children Noelle, Michael, and Gabrielle.